Loftus Road has been home to QPR since 1963. All except the Ellerslie Road Stand are double decker. 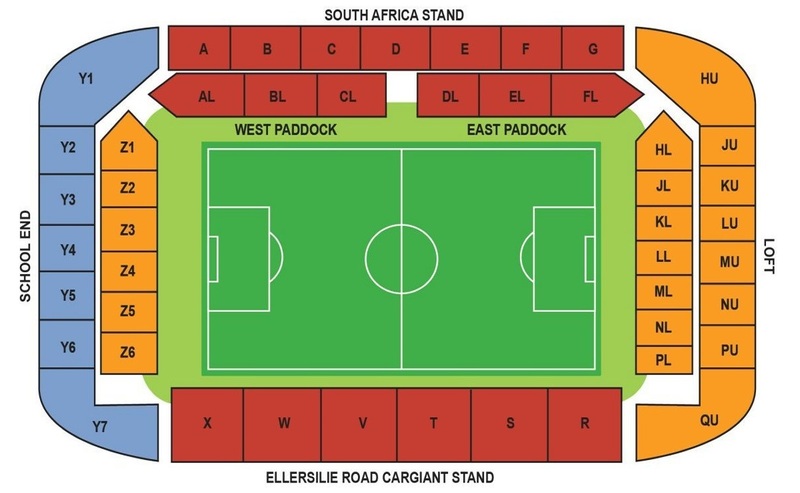 The South Africa Road Stand on one side of the ground, has a larger upper tier, compared to the lower tier, with a row of executive boxes running across the middle. There are a couple of supporting pillars in this stand. The other side, the Ellerslie Road Stand, is single tiered, with a television gantry suspended below its roof. Both ends are similar looking two tiered stands. In the lower tiers you'll rarely find a bad view. Up to 1,279 visiting supporters can be catered for and are situated in the upper tier of the School End behind one of the goals. If demand is high then the lower tier can also be given over, increasing allocations to around 2,500. If the lower tier allocation is all that's taken up, then the upper tier is allocated to home supporters. It used to be a case of 'sit right at the front of the tier, or you can't see all the goal at the near end or even the last few yards of the pitch'. However, the club has shortened the pitch so this shouldn't be a problem any longer. There are a number of pubs on the Uxbridge Road that are heavily used by home supporters, including the Conningham Arms, The Queen Adelaide and The British Prince. They all have the usual facilities of big screen televisions and pool tables etc but have very slow service on match days due to the crowds. Slightly more up market is O’Donohue’s which has a wine –bar feel. This is opposite Goldhawk Road station, the other side of Shepherds Bush market from the Shepherds Bush Hammersmith and City station. As for away fans there is 'The Green' in Shepherds Bush. Exiting Shepherds Bush Underground Station, turn left and The Green is a short way down on the left. The pub sits across from Shepherds Bush Green where there are other pubs to be found nearby, such as O'Neills. Parking is very limited in the streets surrounding the stadium due to the residential permit holder zones. Private car parks are the best bet with spaces opposite the BBC television centre recommended. It is located at the end of Silver Road (near the Royal Mail unit) and costs £6 per vehicle. There are 75 spaces available, so it is best to get there early. Alternatively you can do as a lot of others do and park on the outskirts of London or the immediate area and get the tube. Loftus Road is easily walkable in less than 10 minutes from White City tube station on the Central Line or Shepherds Bush on the Hammersmith and City Line. There is also a Shepherds Bush station on the Central Line but you're best staying on until White City which is nearer the ground. All the relevant stations are in Zone 2 of the London Transport regions. The nearest / closest train station to QPR's Loftus Road Stadium is Shepherds Bush, which is close to the tube station although it's not served by any of the major mainline stations and therefore you're advised to stick to the tube. Travel: Despite being surrounded by several tube stations, one of the harder grounds to find because there is just no help from Shepherd’s Bush Market. You get told to come out and turn right but that's it, once you're out, there is no indication of where the ground is. Better to get off at White City or Wood Lane. Refreshments: Loads of places on Uxbridge Road, though very few of the many MANY pubs allow in visiting fans. Impressions: To be blunt, an absolute hovel. Like Portsmouth and Luton all rolled into one, only without any of the charm. Only Luton has worse legroom, only Portsmouth has a worse ‘concourse’ area. A ridiculous crush, badly managed with everybody having to pile in the same turnstiles at one corner of the stand, then after the game, they send us out at the opposite end! The view from the upper tier is perfect as long as you don't fancy seeing the goal at our end, even only a few rows back I had trouble seeing it, while there were an unbelievable amount of restricted view seats in that end too. When they're charging you upwards of £40 for even the worst seats, there is something a bit morally bankrupt about the place, even in football where everything is morally bankrupt! Atmosphere: Utterly average, alright after they scored, but mostly nothing to write home about. Anything Else: The most unwelcoming away entrance since Reading. A barbed wire temporary fence surrounding the away turnstiles, more coppers than you see anywhere else. Enjoy: Couldn't wait to go home. I like grounds that a bit of a dump and have character. Loftus Road has nothing. Expensive tickets, awful facilities, poor atmosphere, and the most away-fan unfriendly ground in London bar probably Millwall. Unfortunately they stayed up so I'll be back next season…. 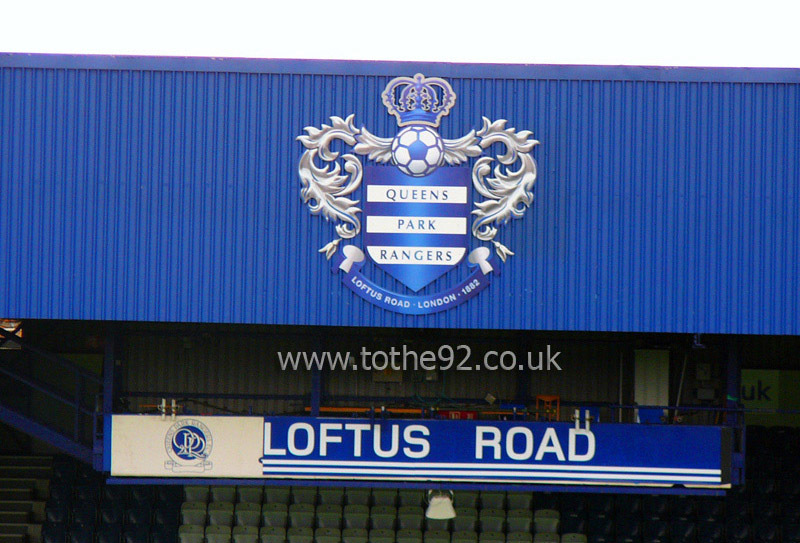 Have you been to Queens Park Rangers' Loftus Road? To tell us about your experiences and to feature on the site, simply complete the fans review form below!